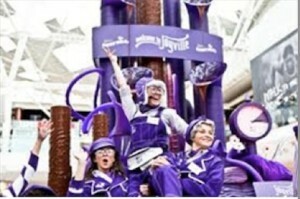 Cadbury used a different approach to engage their chocolate loving audience. Over several years, the company published its Engagement Marketing goal of getting to 1 million “likes” on Facebook. As they reached that goal, the decided to reward their audience with a 48 hour building of a 2 tonne chocolate Facebook “Like” thumb. You can watch their promotional video of the build on the screen below. In engagement marketing, one of your goals is to engage directly with your audience. For Old Spice, this engagement was through the form of videos shot to answer questions posted by their audience on Facebook and Twitter. 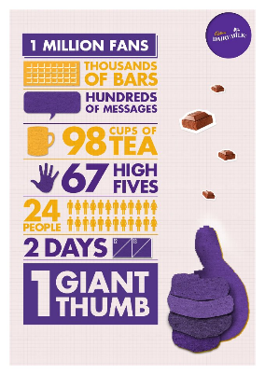 For Cadbury, they developed a Customer Response Wall and then did things suggested by their fans. It included baking a cake and doing other activities during the course of the 2 day build. I really like the way they had fun while engaging their audience. Cadbury also used infographics and other techniques to thank their fans and to promote their dedication to having fun with chocolate.